“Illuminates what happens when medical research is conducted within an unequal health-care system and delivers an American narrative fraught with intrigue, tragedy, triumph, pathos, and redemption.” —MS. On page xiii, Rebecca Skloot states, "This is a work of nonfiction. No names have been changed, no characters invented, no events fabricated." Consider the process Skloot went through to verify dialogue, re-create scenes, and establish facts. Imagine trying to re-create scenes such as when Henrietta discovered her tumor (page 15). What does Skloot say on pages xiii–xiv and in the notes section (page 346) about how she did this? One of Henrietta’s relatives said to Skloot, "If you pretty up how people spoke and change the things they said, that’s dishonest" (page xiii). Throughout, Skloot is true to the dialect in which people spoke to her: The Lackses speak in a heavy Southern accent, and Lengauer and Hsu speak as nonnative English speakers. What impact did the decision to maintain speech authenticity have on the story? 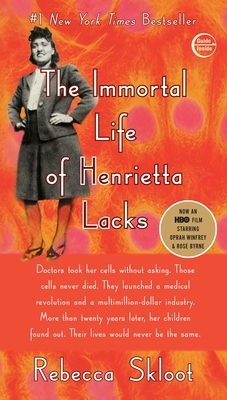 As much as this book is about Henrietta Lacks, it is also about Deborah learning of the mother she barely knew, while also finding out the truth about her sister, Elsie. Imagine discovering similar information about one of your family members. How would you react? What questions would you ask? In a review for the New York Times, Dwight Garner writes, “Ms. Skloot is a memorable character herself. She never intrudes on the narrative, but she takes us along with her on her reporting.” How would the story have been different if she had not been a part of it? What do you think would have happened to scenes like the faith healing on page 289? Are there other scenes you can think of where her presence made a difference? Why do you think she decided to include herself in the story? Deborah shares her mother’s medical records with Skloot but is adamant that she not copy everything. On page 284 Deborah says, "Everybody in the world got her cells, only thing we got of our mother is just them records and her Bible." Discuss the deeper meaning behind this statement. Think not only of her words, but also of the physical reaction she was having to delving into her mother’s and sister’s medical histories. If you were in Deborah’s situation, how would you react to someone wanting to look into your mother’s medical records? This is a story with many layers. Though it’s not told chronologically, it is divided into three sections. Discuss the significance of the titles given to each part: Life, Death, and Immortality. How would the story have been different if it were told chronologically? As a journalist, Skloot is careful to present the encounter between the Lacks family and the world of medicine without taking sides. Since readers bring their own experiences and opinions to the text, some may feel she took the scientists’ side, while others may feel she took the family’s side.What are your feelings about this? Does your opinion fall on one side or the other, or somewhere in the middle, and why? Henrietta signed a consent form that said, "I hereby give consent to the staff of The Johns Hopkins Hospital to perform any operative procedures and under any anaesthetic either local or general that they may deem necessary in the proper surgical care and treatment of: ________" (page 31). Based on this statement, do you believe TeLinde and Gey had the right to obtain a sample from her cervix to use in their research? What information would they have had to give her for Henrietta to have given informed consent? Do you think Henrietta would have given explicit consent to have a tissue sample used in medical research if she had been given all the information? Do you always thoroughly read consent forms before signing them? In 1976, when Mike Rogers’ Rolling Stone article was printed, many viewed it as a story about race (see page 197 for reference). How do you think public interpretation might have been different if the piece had been published at the time of Henrietta’s death in 1951? How is this different from the way her story is being interpreted today? How do you think Henrietta’s experiences with the medical system would have been different had she been a white woman? What about Elsie’s fate? Consider Deborah’s comment on page 276: "Like I’m always telling my brothers, if you gonna go into history, you can’t do it with a hate attitude. You got to remember, times was different." Is it possible to approach history from an objective point of view? If so, how and why is this important, especially in the context of Henrietta’s story? Deborah says, "But I always have thought it was strange, if our mother cells done so much for medicine, how come her family can’t afford to see no doctors? Don’t make no sense" (page 9). Should the family be financially compensated for the HeLa cells? If so, who do you believe that money should come from? Do you feel the Lackses deserve health insurance even though they can’t afford it? How would you respond if you were in their situation? Dr. McKusick directed Susan Hsu to contact Henrietta’s children for blood samples to further HeLa research; neither McKusick nor Hsu tried to get informed consent for this research. Discuss whether or not you feel this request was ethical. Further, think about John Moore and the patent that had been filed without his consent on his cells called "Mo" (page 201). How do you feel about the Supreme Court of California ruling that states when tissues are removed from your body, with or without your consent, any claim you might have had to owning them vanishes? Religious faith and scientific understanding, while often at odds with each other, play important roles in the lives of the Lacks family. How does religious faith help frame the Lackses’ response to and interpretation of the scientific information they receive about HeLa? How does Skloot’s attitude toward religious faith and science evolve as a result of her relationship with the Lackses? On page 261, Deborah and Zakariyya visit Lengauer’s lab and see the cells for the first time. How is their interaction with Lengauer different from the previous interactions the family had with representatives of Johns Hopkins? Why do you think it is so different? What does the way Deborah and Zakariyya interact with their mother’s cells tell you about their feelings for her? Reflect upon Henrietta’s life: What challenges did she and her family face? What do you think their greatest strengths were? Consider the progression of Henrietta’s cancer in the last eight months between her diagnosis and death. How did she face death? What do you think that says about the type of person she was?